Leading Manufacturer of satellite trainer, doppler radar, gps trainer, antenna trainer, satellite communication trainer and rf trainer from Jaipur. Transmit Audio, Video, Digital/Analog data, Tone, Voice, function generator waveforms etc. High gain Parabolic antenna provided for narrow beamwidth and clutter reduction. GPS Trainer Global Positioning System technology is rapidly changing how people find their way around the earth. Whether it is for fun, saving lives, getting there faster, or whatever uses you can dream up, GPS navigation is becoming more common everyday. GPS Trainer will provide a basic understanding of the GPS Fundamentals, Satellites & Design Aspects of GPS Receiver by actually connecting to the Satellite by GPS Antenna. 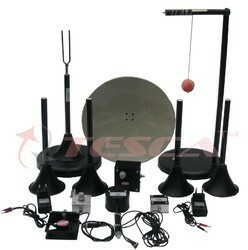 Basic Antenna Trainer has been designed to provide useful tools for hands on experimentation and teaching of various commonly used antennas in UHF-Microwave band in the laboratory for students of all levels. It can be used in stand-alone mode. In this system, receiving antenna is rotated manually from 0 to 360 degrees and accordingly the signal strength can be monitored on the Receiver. It comes with a Polar plotting software for storing readings manually. 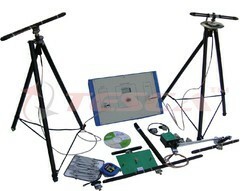 PC Based Manual Antenna Trainer has been designed to provide useful tools for hands on experimentation and teaching of various commonly used antennas in VHF-UHF-Microwave band in the laboratory for students of all levels. It can be used in stand-alone mode as well as be interfaced with a computer via USB interface. In this Receiving antenna is rotated manually from 0 to 360 degrees and accordingly receiving antennas signal strength can be monitored on the Receiver. 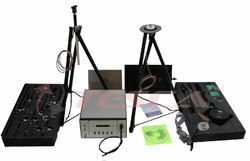 The system consists of a set of two tripods one for mounting the transmitting antenna and another for mounting the receiving antenna, 22 Antennas, RF Transmitter/ Receiver, Antenna Plotting Software and relevant accessories/ cables. 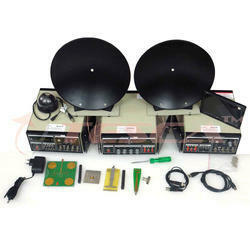 Satellite Communication platform provides an in-depth study of basic Satellite communication system. It consists of Uplink Transmitter, Satellite Link and Downlink Receiver, which can be conveniently placed in the laboratory. The Satellite can be placed at an elevated position if needed. The Satellite Transponder receives signal from Uplink Transmitter and retransmit at different frequencies to a Downlink Receiver. Voice, function generator waveforms etc. 2414 - 2468MHz PLL microwave operation. 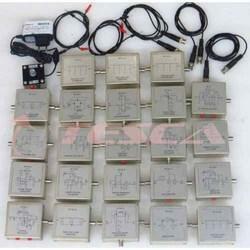 Communication of external broad band digital signal. waveforms can be studied. 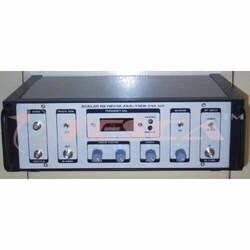 The frequency range and high sensitivity is suited to EMI/EMC measurements, both radiated and conducted. 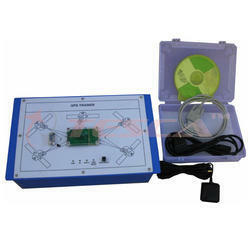 A tracking signal source along with directional coupler can be used to measure any two port network.